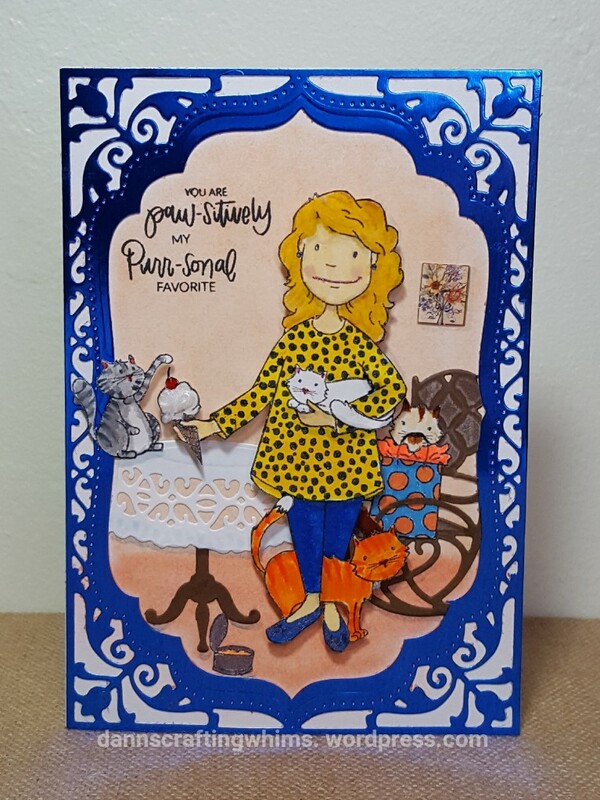 This entry was posted in Cards, Friendship Cards, Papercraft, Thank You Cards, Thinking of You Cards and tagged Cat card, catlovershop2018, ellenhutsonllc, Essentials by Ellen Leading Ladies - Cat Lady, Essentials by Ellen Leading Ladies - Celebration Lady, K&Company SW Spring Blossom Seed Packet, NeverStopMaking, Spellbinders, Spellbinders Elegant Labels 4, Spellbinders French Frills, Spellbinders Lounge Around by dannscraftingwhims. Bookmark the permalink. A super fun card AND envelope D Ann, nicely done. I visited Ellen fb page to Thank them for sponsoring! Thanks for your participation in the Cat Lover’s hop also and YOUR giveaway. (I would L♥VE to win this one!) Much appreciated. How cute and fun scene!! Love the gorgeous frame and all your fussy cut details!! Ooh – that little kitty between her ankles!! These little cats are just so sweet! Love the border, its gorgeous! 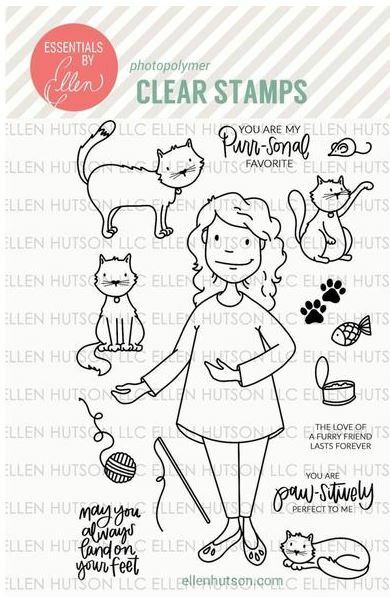 I LOVE this amazing Cat Lady stamp set! You have created such an adorable card with this – – love the fun colors and all the special little touches you have added! It looks amazing! I have like Ellen Hutson on FB and shows them a little love! Thanks for being a part of the 2018 Cat Lovers Hop! What a pawsome scene this is! Cute picture on the wall, kitties having a ball (& going to steal a cherry, I believe!!). Love this! I like EH on FB and have thanked them. The ice cream does look realistic. I visited Ellen Hutson’s facebook page too. I’ve been connected with so many wonderful designers who are new to me through this hop. Cute scene. I like the colors and the texture. I am not on Facebook. This is so adorable, and that kitty is about to snag that cherry on the ice cream for sure. Left some love on FB for Ellen Hutson and already LIKE them. Already follow you on IG as karenladd510 and left some love there as well. 1. Beautiful card! Love this stamp set! I’ve just left some love on Ellen Hutson FB page (Arianna Barbara). and you made great scene with cat lady! 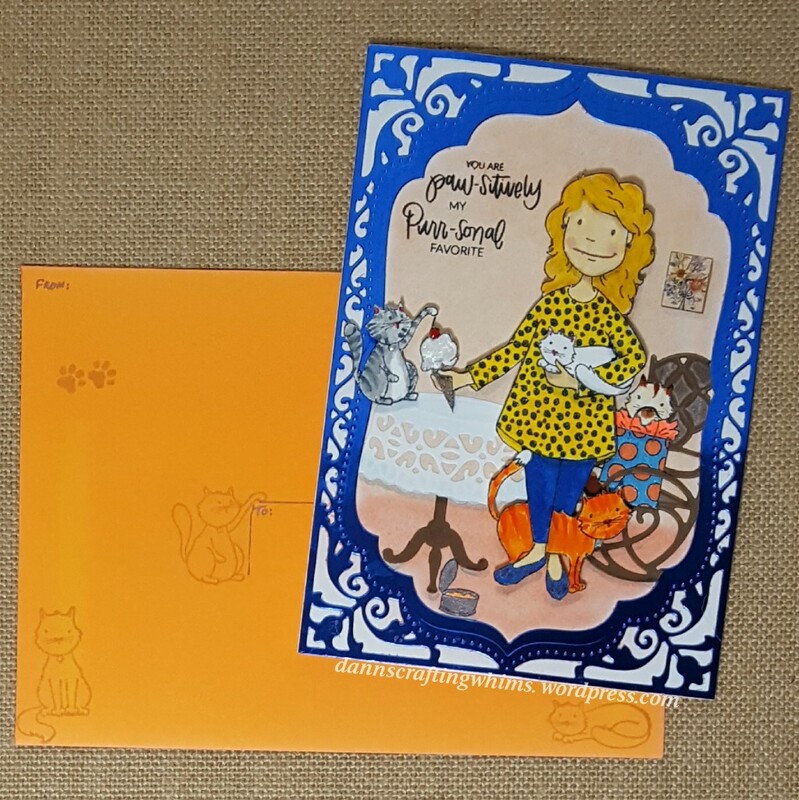 LOVE the Cat Lady stamp set… I had not seen it before! Adorable card! Love the details like the tablecloth you added! Left a comment on FB thanking Ellen for sponsoring the prize! Following on Instagram and left a comment! Its a beautiful. I have been over to the Ellen Hutson FB page, liked and commented. Already follow you on IG as pingvf499 and left some love there as well. What an amazing sponsor and fabulous stamp set!!! I love your wonderful card, D.Ann. Looks like me in my younger years. 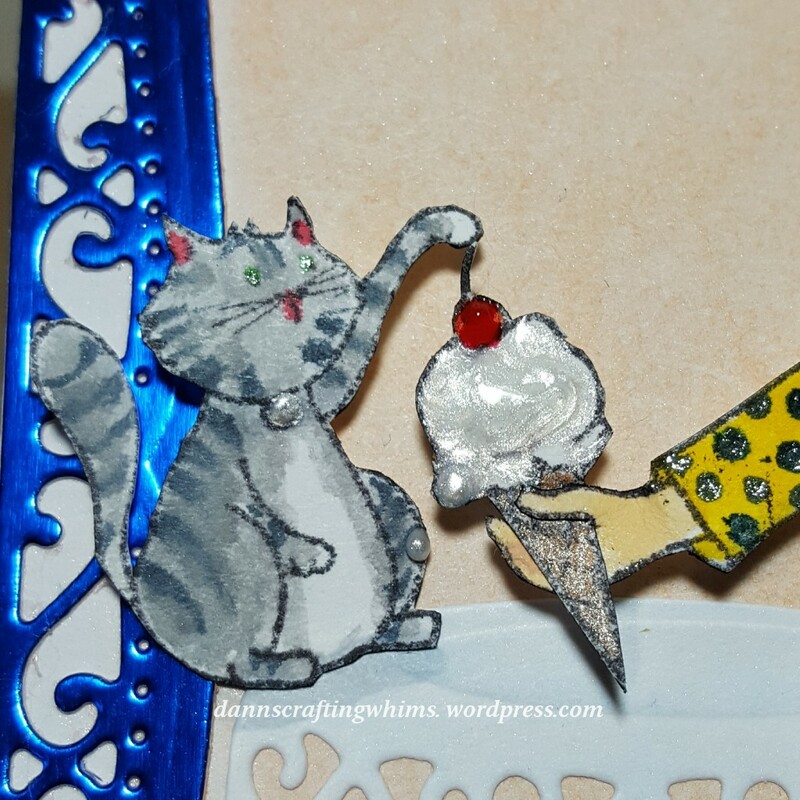 🙂 The swirls of ice cream look amazing with the glossy cherry….stay away, kitty! I adore the tablecloth, too!! Thank you for the chance to win this stamp set! Oh, I nearly forgot to say that I FB’d the lovely sponsor, too….liked, thanked, etc etc. They are so super-generous to offer this amazing stamp set!! Your scene is so adorable and I love the kitty going for the ice cream! LOL! Awesome colouring and design! Love the frame around the picture too! I also like and commented on Ellen Hutson Facebook page and shared it out. I am gonna give it a go even though I am late 🙂 This card so reminds me of my cats!